Norway mass killer says Í can explain´. (Reuters) – Anders Behring Breivik wants to tell Norway and the World why he killed at least 93 people in a bomb attack and shooting rampage when he appears in court on Monday, his lawyer said. Calling himself a crusader against a tide of Islam in a rambling 1,500-page online manifesto, the 32-year-old mass murderer wants the opportunity to explain actions he deemed “atrocious, but necessary”. Lawyer Geir Lippestad said his client had admitted to Friday’s shootings at a Labor youth camp and a bomb that killed seven people in Oslo’s government district, but that he denies any criminal guilt. In other instances of gunmen going on killing sprees the perpetrators often commit suicide when the police arrive or actively provoke officers to shoot them dead. It was not clear how long Breivik will have to talk in court since the hearing will be about custody and he will not be required to enter a guilty or innocent plea. Police on Monday played down a report in Norwegian media they had already decided to asked for the hearing, in which a judge is set to remand him in custody, to be held behind closed doors. “It’s up to the judge to decide. It’s not uncommon that the police will ask for it in advance but I don’t know if the police will ask for that,” Liv Corneliussen, a police prosecutor, told Reuters. The issue could trigger a debate about freedom of expression with many Norwegians opposed to allowing a man who has shaken the nation’s psyche the right to speak out. “He has said that he believed the actions were atrocious, but that in his head they were necessary,” he said, adding his client did not feel he deserved punishment. The worst peacetime massacre in the normally placid country’s modern history appears to have been driven by Breivik’s mission to save Europe from what he sees as the threats of Islam, immigration and multi-culturalism. Police believe Breivik acted alone after becoming disenchanted with mainstream parties, even those that have gained popularity and parliamentary seats on anti-immigration policies in otherwise liberal and tolerant European countries, including affluent Norway. The attack was likely to tone down the debate on immigration ahead of September local elections, analysts said, as parties seek to distance themselves from Breivik’s beliefs and reinforce Norwegians’ view of themselves as an open, peaceful people. Norway’s immigrant numbers nearly tripled between 1995 and 2010 to almost half a million in a population of 4.8 million. The sense that many were drawn by Norway’s generous welfare handouts helped spur the growth of the Progress Party which became Norway’s second biggest in parliament after the 2009 election on a largely anti-immigration platform. Breivik was once a member of the party, but left complaining it was too politically correct. It was then he began scheming to “resist,” burying ammunition more than a year ago, weight-lifting, storing up credit cards and researching bomb-making while playing online war games. After three months of laboriously pounding and mixing fertilizer, aspirin and other chemicals on a remote farm, Breivik drove a hire car packed with the results to the center of Oslo on Friday, triggering the device outside government offices, killing seven and shattering windows for blocks around. He then drove to the small island of Utoeya, 45 km (28 miles) away, and dressed as a police officer shot dead 86 people there on a youth summer camp for the ruling Labor Party as teenagers made desperate attempts to hide in the woods, under beds or leapt into the water and tried to swim the mainland. A surgeon at a hospital that treated 35 of the wounded young people said Breivik seemed to have used a type of “dum dum” bullet that fragments inside the body to cause maximum damage. “These bullets don’t explode inside the body but fragment into pieces more quickly than other bullets,” Colin Poole, chief surgeon of the Ringerike district hospital, told Reuters. While Breivik hunted down victims on Utoeya, it took police a full hour to get a team of elite forces to the island after one boat, overloaded with officers and equipment, was forced to stop when it began to take on water. Norwegian television managed to charter a helicopter and filmed the killer before the police showed up. 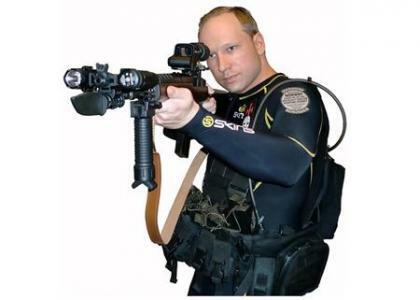 When police did arrive, Breivik gave himself up without a fight. The Oslo court is due to rule on a formal police request to keep Breivik in custody, a requirement within 72 hours of an arrest. An exact time for the hearing has not been set but is likely after 1 p.m. (1100 GMT). Police can, for instance, request detention of eight weeks in solitary confinement with no access to news, letters or visitors, except a lawyer. That then can be extended. Police have said a trial could be a year away. Under Norwegian law, a suspect can be sentenced to a maximum of 21 years in jail, but that can be extended if courts decide there is a risk of repeat offences. “In theory he can be in jail for the rest of his life,” said professor of criminal law at the University of Oslo, Staale Eskeland. Norway will also stop for a minute of silence at midday and there will be a torch-lit procession in the evening. Norwegian markets will also reopen on Monday, but bureaucrats whose offices have been wrecked will have to go to alternative offices.